Add to My Favorite Store. 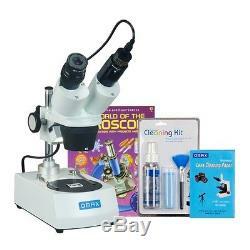 OMAX 10X-20X-30X-60X Binocular Stereo Student Microscope with Dual Lights, 5MP Camera, Cleaning Pack and Book. This is a stereo binocular microscope with binocular viewing head. The microscope has 10X, 20X, 30X and 60X four step magnifications with dual tungsten lights from both top and bottom. The microscope takes 110V power input. It has large working distance of 57mm and maximum field of view of 10mm. The package also contains a 5MP microscope camera, a cleaning pack and a microscope book - "The World of The Microscope". The 5 MP (2592x1944 pixels) USB digital imaging system captures still microscope images and live video on computer. The included software compatible with Windows (see version information below). The user-friendly editing and processing software for Windows offers advanced features including stitching, EDF (Extended Depth of Focus), video recording and measurement functions. The software allows you to make notes, shapes, and watermarks with ease. You can analyze, present, and share images of samples and specimens using the software. The cleaning pack consists of a 100 sheet lens cleaning paper booklet, and a 3 piece cleaning kit. The book investigates the enormous variety of objects too small for the eye to see, from insects, to rock crystals and microchip circuits. The step-by-step diagrams will show you how to get the best results from a microscope. It covers different types of microscopes and there are plenty of exciting suggestions for projects which reveal the incredible detail of everyday objects. This stereo microscope is a good choice for people who like to collect coins, stamps, rocks, gemstones but with low budget. It is also a good choice for students who would like to inspect insects, botanical specimens and etc. 5MP color digital camera compatible with Windows. 45°inclined binocular head on metal stand and framework. Dual lights: incident and transmitted, diopter adjustment on left ocular-tube. Adjustable focus knob tension and inter-pupillary distance. Includes the cleaning pack and the introductary book - "The World of The Microscope". Total magnification: 10X, 20X, 30X and 60X. Eyepieces: wide field WF10X/20, WF20X. Objectives: rotational 1X & 3X. Left ocular-tube diopter adjustment ±5dp. Interpupillary distance: 2-3/16" 2-15/16"(55-75mm). Incident (upper) illuminator: 12V/10W tungsten. Transmitted (lower) illuminator: 12V/10W tungsten. Easy illumination mode switch: [upper] [off] [lower]. Frosted glass stage plate: 3-3/4 (95mm) in diameter. White/black plastic stage plate: 3-3/4 (95mm) in diameter. Head vertical moving range (along the pillar): 2-3/4 (70mm). Focusing adjustment range: 1-5/8 (42mm). Power supply: 110V (US and Canada). Digital camera: - True color 2592x1944 pixels (5MP) - Frame speed: 2fps at 2592x1944, 3fps at 2048x1536, 5fps at 1600x1200, 7.5fps at 1280x1024 - Software compatible with Windows operating systems - O ffers c apturing still images , stitching, EDF, video recording and measurement functions - USB2.0 cable included. Cleaning Pack: - 100 4"x6" cotton lens cleaning sheets - Brush length: 5-1/2" (13.5cm) - 100ml of cleaning solution - Cleaning cloth size: 5-7/8" x 6-3/4 (15 x 17cm). Microscope book: "The World of The Microscope". Dimension: 9" x 4-3/4" x 12 (23cm x 12cm x 30.5cm). Please check the chart below for computer operating system compatibility. Binocular stereo microscope with WF10X/20 eyepieces. A pair of WF20X eyepieces. Frosted glass objective stage plate. Wrench for focus knob tension adjustment. Allen key for stage lock. 1 CD including driver, software and user's instruction. 30.5mm eyetube conversion adapter. Cleaning Pack - One booklet of 100 lens cleaning sheets - One cleaning cloth - One bottle of non-aerosol cleaning solvent - One brush. A: We are happy to leave feedback for our customers once we have been paid and the item has been delivered to the carrier. We would appreciate that once you receive your item, you also leave us feedback. If you feel that you cannot leave a Positive comment with all 5 stars - WE WILL EARN IT. We are here to exceed your expectations! The item "OMAX 10X-20X-30X-60X 5MP Camera Binocular Stereo Microscope+Cleaning Pack+Book" is in sale since Monday, March 14, 2016. This item is in the category "Toys & Hobbies\Educational\Science & Nature\Insects & Bug Habitats". The seller is "bh542" and is located in California. This item can be shipped worldwide.